Equestria Daily - MLP Stuff! 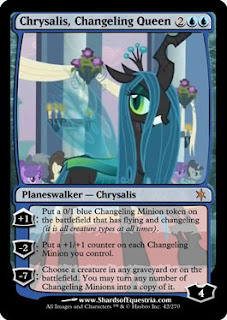 : Shards of Equestria (Pony Magic the Gathering) Launches! Shards of Equestria (Pony Magic the Gathering) Launches! The MLP MAgic the Gathering set has been released. After a few months of playtesting and feedback gathering, most of it should be balanced up. Honestly, the second this hits one of those online card programs (Lacky if that still exists, haven't played in years) I wouldn't mind running a draft tournament or something. These look like a ton of fun. Anyway, check out the full set on their page here! Right now they have several ways to download and print them. Hopefully you all have some likeminded MTG pony fan friends! 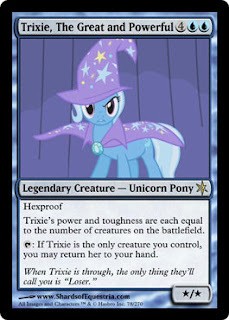 I have no clue what planeswalkers do, but back in my day we played white/green aggro, and Trixie looks like a blast for something like that. Mane6 Fighing is Magic Livestreaming Again!